For contractors, farmers and anyone else in need of some muscle for their projects, Hireways Machinery Rental is a rental firm with its focus firmly on the customer. It’s a family owned and operated company – originally established in Palmerston North 1997 by John Hart and his two sons, Joe and Tim. Joe later split off to set up his own hire business in Masterton, and John and Tim continued to grow Hireways, expanding to open a second branch in Porirua. The company has grown substantially in the past five years and now has a staff of over 55 and a full range of machines – 700 in total – available rent in its two branches, from which they service the whole of the lower North Island. The company’s growth comes on the back of exceptional customer service – their reputation for ‘best customer service’ is a record they aim to keep. Each member of the team at Hireways knows that the customer comes first, and it’s this attitude, coupled with some of the best equipment you can hire, that has ensured the company’s success. But they’re aware that exceptional service is just part of the equation; having top quality gear that suits their customers’ requirements is the other essential element. 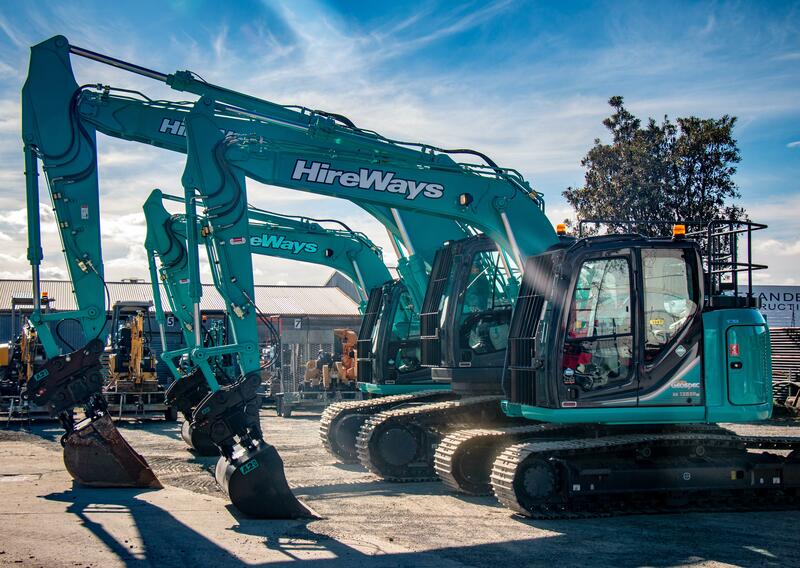 Consequently, Hireways’ range of machinery comprises some of the leading names in equipment manufacture, and these rental products are regularly maintained to keep them in top-notch condition. Hireways started its business providing tractors to farmers. From there it diversified into excavators, and these days provides a comprehensive range of high-quality construction gear, including Attach2 buckets, to some of the biggest contracting firms in the country. As a supplier to Hireways, Attach2 also shares this customer-focussed philosophy and passion for quality – we know as well as Hireways does that robust and reliable machinery is just a starting point. Excellent service goes a long way to making projects run smoothly and efficiently. The range of equipment available at Hireways is extensive and made up of some of the world’s leading machinery brands. Their range of diggers include Caterpillar, Volvo, Kubota, Kobelco, and more. Managing director Tim Hart says their excavators range in size from a compact 3.5 tonner all the way through to a grunty 70 tonne digger. There is loads of other construction gear too, from small hand compactors to hefty rollers; compact skid steers, all the way up to grazers, loaders and dozers. Then there are trucks and trailers; trenching gear; pumps and water blasters; generators and lights; telehandlers; and so much more, including a comprehensive range of Attach2 attachments, including over 15 multi grab buckets. However, Tim says they not only offer a fuller range of machinery than other rental companies, they also pride themselves on having a very late-model fleet. In fact, the average age of their equipment is just three years. “We replace our gear at lower hours,” says Tim. This policy ensures that customers always enjoy new equipment that is in excellent condition. This equates to fewer breakages, less downtime and a lot less hassle. And if there ever is a problem or if a machine needs servicing, a technician is never far away. On top of this, Hireways fully valets each machine each time it returns to depot – not once, but twice – and then thoroughly checks it before issuing a pre-hire tag. This way, their customers enjoy peace of mind that the gear they’re hiring is in great working order. We asked Tim what their most popular rental was, and he says the 12-13 tonne excavators are the most common hire. Interestingly, he says that a few years ago it was the smaller, five tonne digger that was the most popular. But people want bigger gear now, and he suspects in another couple of years or so, everyone will be after the 20 tonners. In its range of rental equipment, Hireways has 20 Hydrema articulated dump trucks. The brand is imported by Hireways’ sister company, NZAM Machinery Sales, which is the New Zealand agent for the brand. Manufactured in Germany and Denmark, Hydrema is known for its quality, comfort, and off-road performance. They’re easy to use and durable. Complementing Hireway’s excavator range is a variety of different attachments from Attach2, able to tackle any job. Every excavator available for hire, regardless of size, has a rock bucket, tilt bucket, trenching bucket and grab bucket to fit. In addition, Hireways also has Attach2 rippers, root rakes and stone grabs for hire. Attach2 attachments meet Hireways’ preference for high quality, durable gear. If that means going to Attach2 for a different bucket or other attachment, then that’s what happens. The relationship between Hireways and Attach2 is a strong one – they’ve been working together for a number of years now and the two firms seem to share the same values and perspective. For both firms, service is paramount. “Attach2 give us very good service and support. They back up what they sell,” says Tim. “They respond well to feedback, and act quickly to ensure we get what we need. It’s how they’ve built up their business, by listening to their customers." “Their products have only improved over the years. They’re using higher grade steel which lasts better, and its lighter too which improves the efficiency and economy of the excavator. We currently run Attach2 couplers and attachments on 90 percent of our excavators."